You may use this page to obtain a fillable pdf form that you can download, complete and return to the City. Please follow these simple instructions. Right-click on this link: Employment Application. You will be asked to save this form or to save the link. Make a note of the location on your computer where the file is saved. Open Adobe Reader. If you do not have this program installed on your computer, you can download it for free here. Click the “Open” icon or “File->Open” from the menu and navigate to the location where you saved the downloaded Job Application Form. Fill in the Job Application Form with your information. Print the completed Job Application form and sign it. 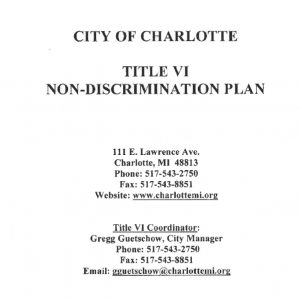 Return it to City Clerk, 111 E. Lawrence Avenue, Charlotte, MI 48813.